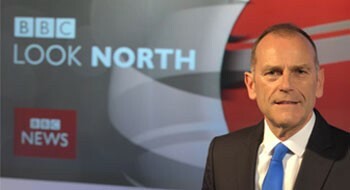 BBC Look North news and sports presenter Jeff Brown will be taking up compering duties next week on the RAF in Concert tour - the last official event celebrating RAF100. A familiar face on TV screens, Jeff began his journalistic career with the Birmingham Post & Mail newspaper group in 1982, spending four years in the West Midlands before returning to his native North East to cover sport for The Journal. In 1996 he moved to Tyne Tees TV as a sports reporter, before switching channels to join the BBC in 2003. In 2010 Jeff was awarded an honorary fellowship by Sunderland University for his services to the media industry, and he was recently installed as a Deputy Lieutenant for Tyne & Wear. Jeff will host the concert when it arrives at Sage Gateshead on Thursday 4 October. He said: "We already know the RAF have some of the most talented pilots, engineers and technicians, so no-one should be surprised to hear their bandsmen and women are among the best, too. It's a real privilege to be asked to host the RAF's Centenary concert at Sage Gateshead - a world-class music venue for a world-class band". From rousing military marches to toe-tapping big band numbers and timeless classical pieces, accomplished musicians from the RAF's Central Band and Salon Orchestra are set to deliver a rousing finale to the first 100 years of the RAF. The concert will feature classic military tunes including The Dambusters March and Spitfire Fugue and national favourites such as British Grenadiers, Home Sweet Home and Saucy Arethusa, as well as the big band sound of Glenn Miller's In the Moodand Keep 'em Flying. For ticket details visit the Sage Gateshead box office at www.sagegateshead.com or call 0191 443 4661. The concert begins at 7:30pm.